§Thanks to Bob Tisdale, we now know that the effect of El-Niño’s upon global temperature have been underestimated. §The El Niño’s seems to be an important player in the recent rapid warming of the worlds temperatures between 1976 & 2005. 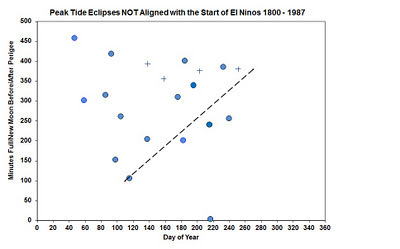 §But what if extreme tides caused by the Moon play a role in triggering El Niño[/La Niña] events? A. When the Earth, Moon and Sun all align. 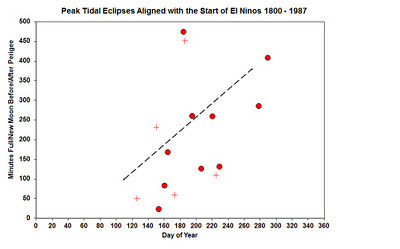 These extremes in the tides are known as Spring Tides, occurring twice per month at New and Full Moon. B. 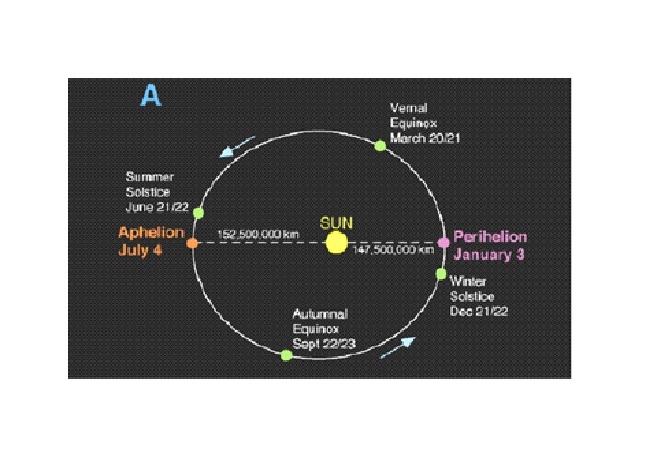 When the line-of-apse of the lunar orbit (connecting the points of perigee and apogee in the lunar orbit) align with the Sun (as seen from Earth) at New and Full Moon. New Moon at perigee reoccurs once every 20.293 years. Of course, it takes half this time i.e. 10.147 years to go from a New Moon at perigee to a Full Moon at perigee. These types of extreme tides are known as Perigean Spring Tides. C. The strength of Perigean Spring Tides are enhanced by the fact that not all perigees are the same. 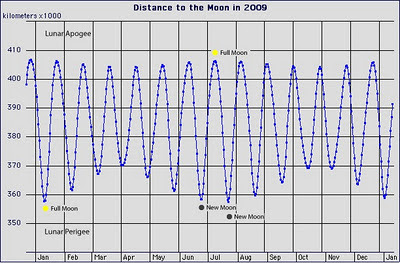 The following graph shows that the Perigean distance of the Moon varies between roughly 370,000 and 356,000 km. 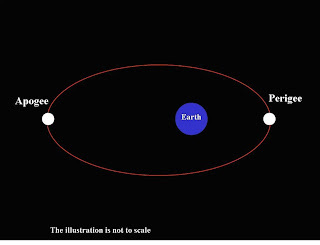 If the Perigean Spring Tides occur when the Moon is at closest perigee (i.e. at or near to 356,000 km), they become known as Proxigean Spring Tides. D. When the line-of-nodes (connecting the ascending and descending nodes of the lunar orbit) align with the Sun, as seen from the Earth, at times of New and Full Moon. 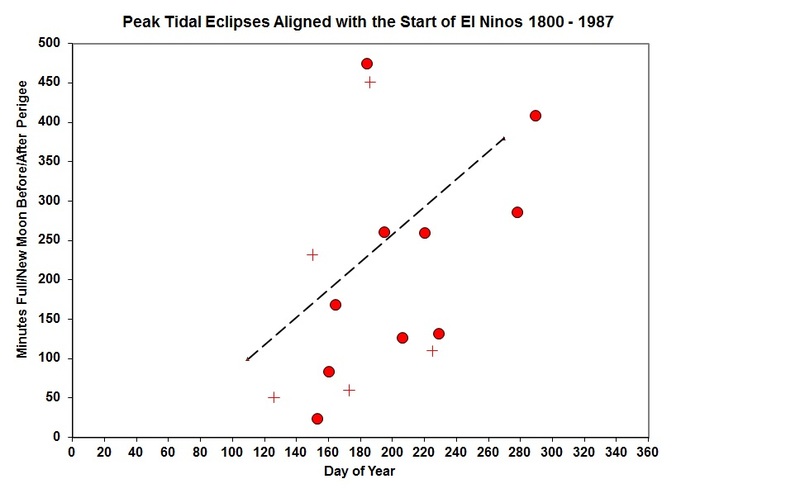 If these types of alignments occur at or near the times of Perigean Spring Tides [often associated with solar and lunar eclipses], it further enhances the strength of these tidal event. If the line-of-nodes of the Lunar orbit points along the Earth-Sun line at New moon, it will take 3.796 years for a New Moon to reoccur under the same circumstances. Of course, it takes half this time i.e. 1.898 years to go from a New Moon when the line-of-nodes are aligned with the Earth-Sun line, to a Full Moon under the same conditions. 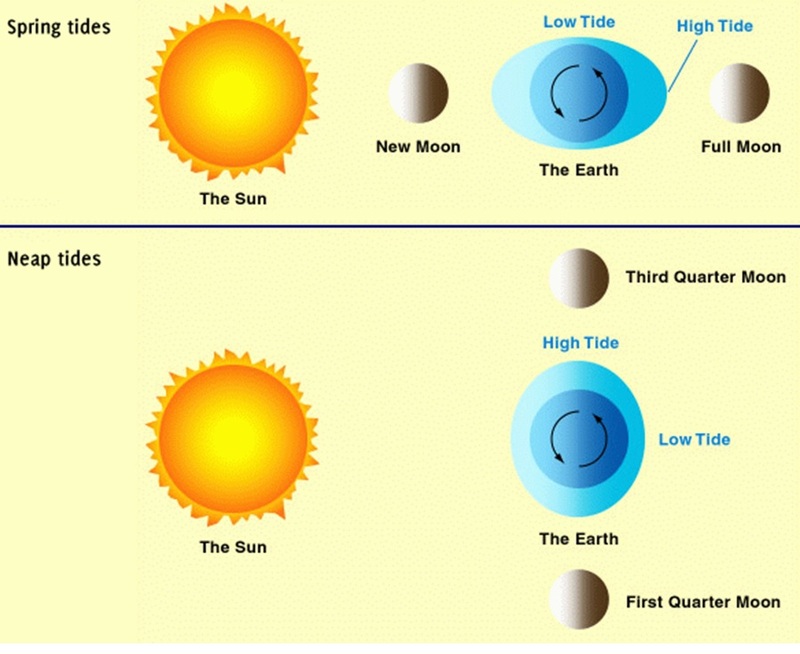 E. The last factor that enhances Proxigean Spring Tides is the proximity of the Earth/Moon system to the Sun. 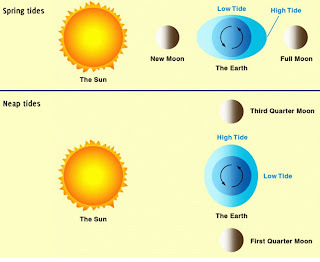 Clearly, since roughly 1/3 of the Solar/Lunar tides are caused by the Sun, any tidal event will be stronger if it occurs at or near the Earth's/Moon's closets approach to the Sun. This occurs on January 3rd at a point in the Earth's orbit known as Perihelion. 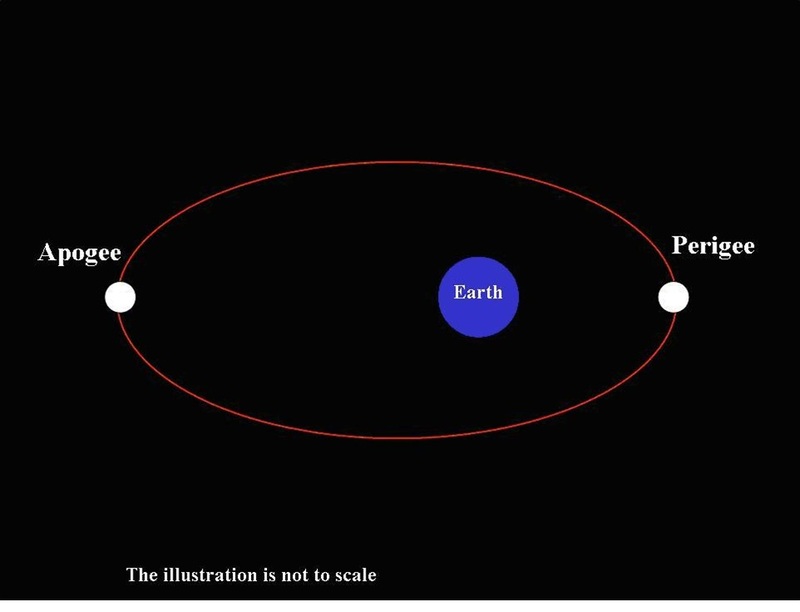 Any Proxigean Spring Tide that occurs at or near an alignment of the line-of-nodes of the lunar orbit, will be further enhanced if it occurs at or near Perihelion. These type of tides are known as Extreme Proxigean Spring Tides. It is important to note that if a new Moon (or Full Moon) occurs at Perihelion, it will do so again once every 4.00, 15.00 and 19.00 Tropical years. Extreme tidal effects are known to have an important influence upon the amount of up welling of cool deep ocean water in the world's oceans via deep ocean tidal dissipation. The amount of power deposited by the Sun and the Moon through deep-ocean tidal dissipation could be as much as 1 Terra-Watt ! This is enough power to drive almost half all the up welling of deep cool ocean water around the world!! 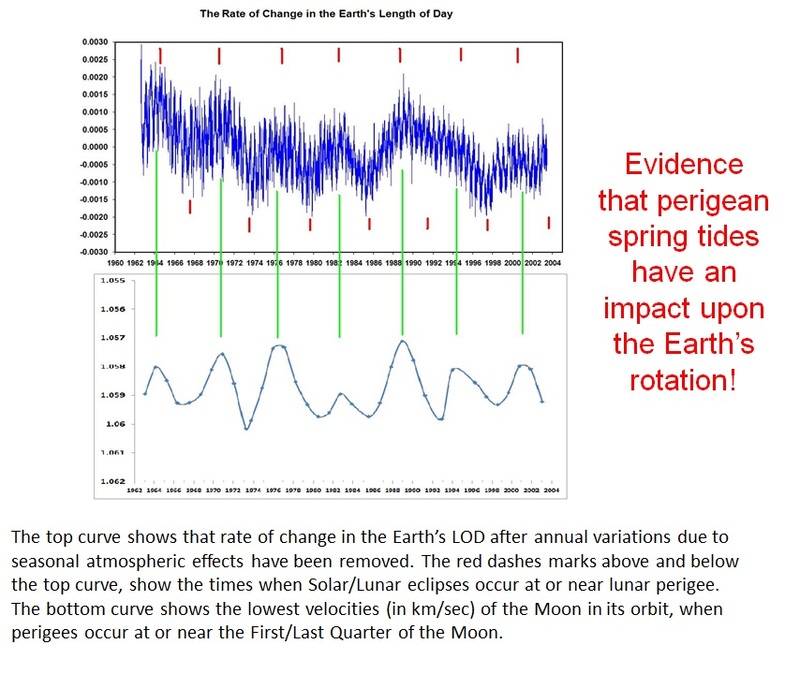 and there is compelling evidence, as well, that shows that Perigean Spring Tides have an impact on the Earth's rotation. 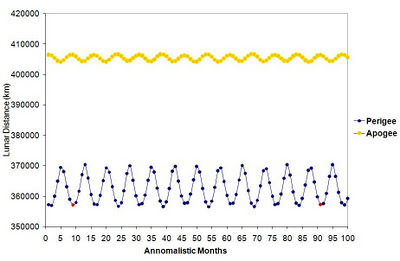 So what does this have to do with the ENSO El Nino/LA Nina phenomenon? 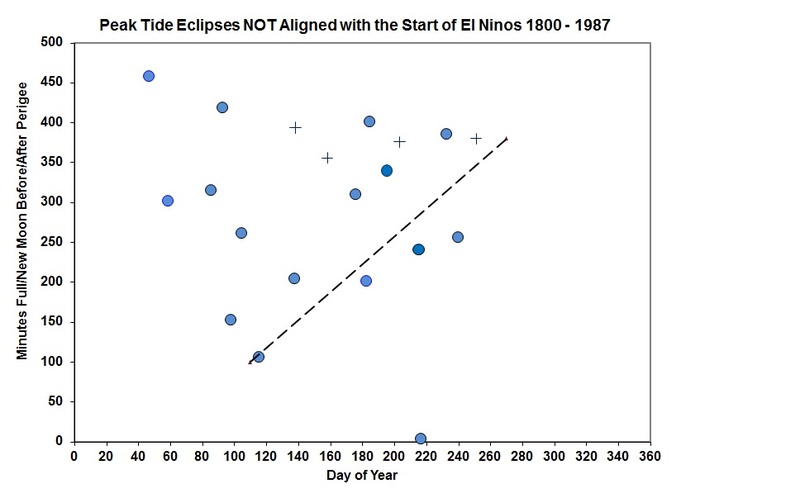 Well, if you look at the type of Proxigean Tides that occur in the year of or the year prior to the onset of all significant El Niño events between 1800 and 1987, you find that only the most extreme of these events occur at this time. The following two diagrams are designed to place the most extreme Proxigean Spring Tides in the bottom right hand corner and the weakest Proxigean Spring Tides in the top left hand corner. The day of year, starting on April the 1st (no joke intended here), is shown along the X-axis. 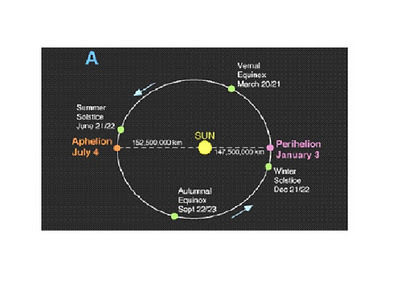 This starting date has been chosen so that Perihelion occurs on or about day 278, placing it on the right hand side of the diagram. 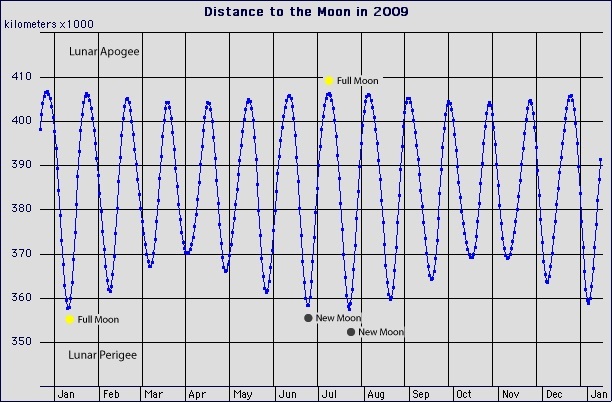 Along the Y-axis, we have the number of minutes an eclipsing New or Full Moon occurs before or after perigee. This axis has been chosen to ensure that strongest alignment between the Earth-Sun line, the line-of-nodes, and the line-of-apses occurs near the bottom of the diagram. 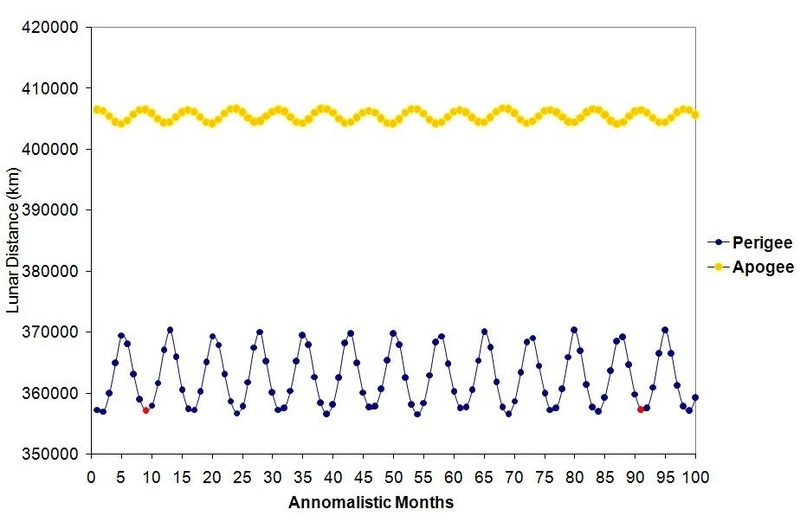 During years that DO NOT coincide with the year of or the year prior to the onset of all significant El Niño events between 1800 and 1987, you get systematically weaker proxigean tidal events. There is evidence to support the claim that the Perigean Spring Tides affect the Earth's rotation rate. 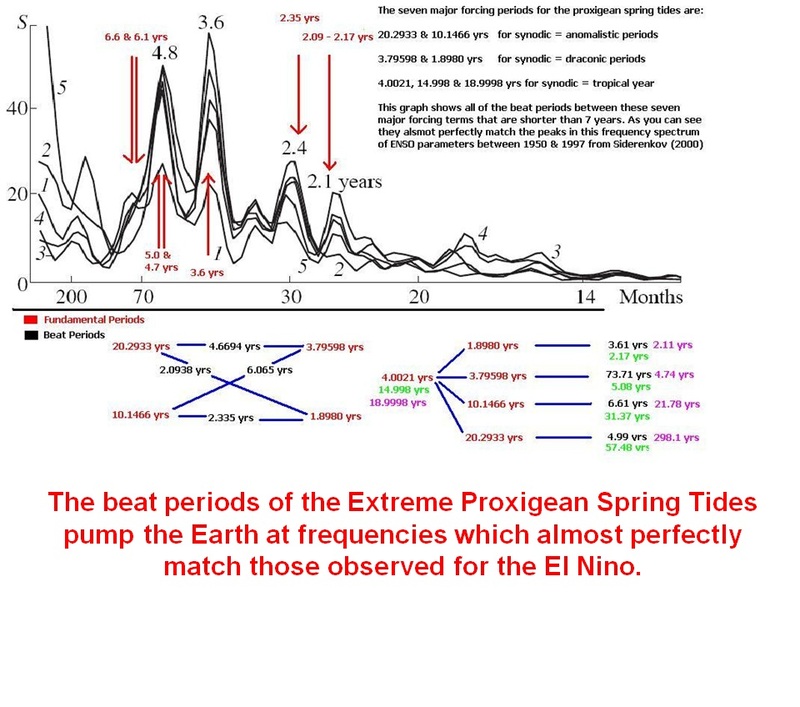 The beat periods of the forcing terms of the Extreme Perigean Spring Tides pump the Earth at frequencies that almost exactly match those that are observed in the periodogram of the SOI index between 1950 and 1997. There is evidence to support the contention that most extreme lunar tidal events (i.e. 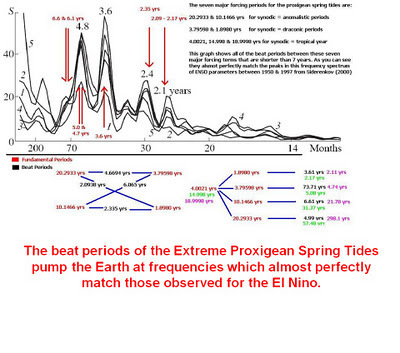 the extreme Proxigean Spring Tides) must play a role in triggering the El Niño phenomenon between 1800 and 1987.